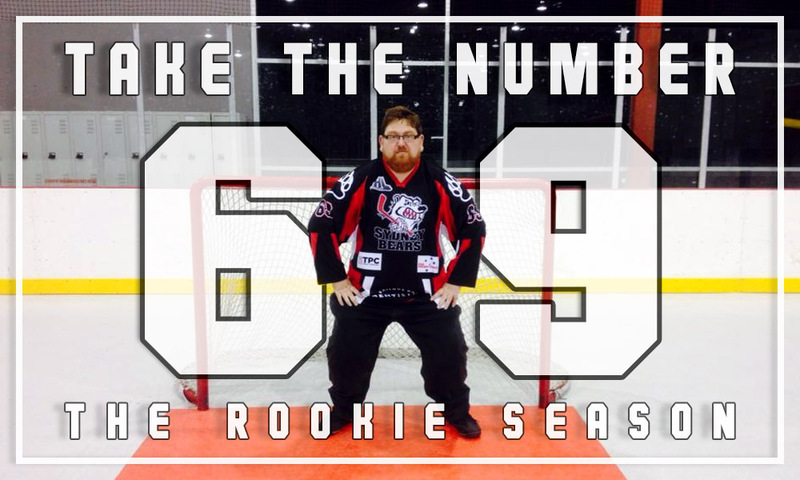 Welcome to Take the Number 69, a blog by Eric Brook charting his journey in hockey. With his rookie season as a Beerginner done, Eric looks back and shares the highlights plus what’s to come in the future. After an excellent rookie debut, it is time to wrap up the Beerginners season while also looking forward to season two. What did I discover about myself and other people during the rookie season? I confirmed that hockey is a happy place for me. It does not matter to me if I am watching, playing, commentating, training or coaching. I enjoy being around like-minded people who are also enjoying what they are doing. There have been some horrible moments in 2017 for me away from the rink in my personal and family life. However, there have been many hockey highlights for me. It is important for me to have a happy place and I know that hockey is one of those places for me. I have a demanding job and hockey is an escape from that. A hockey rink is a great place for me. Big, small – love them all! I am so glad that I decided to sign up for Beerginners and then take three months of leave from my place of employment. Partially because of hockey and partially for personal/family reasons. The break from my shift working life and not living via a roster was appreciated. I was also thankful to be able to eat how and when I wanted rather than being dictated to by a person in an office and a timetable. It is the best that I have eaten and exercised over an extended period and I feel as fit as I ever have as an adult. Of course, I can still improve. I know that consistent training and coaching is a key to improvement. Also appreciated was the amount of support that the other Beerginners received, especially the more inexperienced players and skaters. There is so much to learn about playing the game in addition to the skating required. Some Beerginners saw their lack of skating and/or playing ability as a challenge that they wanted to conquer. Everyone’s hockey journey is different and there is no one correct way to follow your chosen path. Regardless of which path you choose, there will be people willing to support you. Seeing improvement amongst the Beerginners was a highlight of the season. Personally, I have received an amazing amount of support and feedback about my hockey journey so far and also about this blog. It still stuns me that people read this blog and go to the effort to share their feedback and experiences with me. I can find it difficult to deal with the excellent feedback because it does not come naturally to me. I can find it difficult to beat my own drum. As discussed on an earlier episode of the Grassroots podcast, there is a fine line between being positive and confident compared to being over confident, arrogant and difficult to be around. Like keeping in touch with people via social media, I have enjoyed keeping people updated about my progress in addition to other Beerginners. It will also be a good personal reminder about my rookie season. I also hope that it can be a guide for others considering playing hockey. I know there are plenty of people who have guided me through my hockey journey. Somewhat obviously, I enjoy sharing my experiences. I also enjoy learning how other people learn and how they progress. I have learnt that not everyone responds the same way to training and development. It was not always easy and I had doubts along the way. My hockey journey took unexpected routes and detours during the season. I had zero plans to take my skating off the ice and onto a hard surface that isn’t frozen. However, it did happen and I am pleased that it did. I have also received an amazing amount of support from the inline hockey community. I have also noticed a crossover between inline and ice hockey that does not seem to happen with field hockey. My inline skating and hockey journey will continue during summer. The hockey that I was a part of during this debut season of Beerginners was beyond my expectations. Aided by more experienced players and coaches, the newer players who stuck around found their skills improving as the season went on. Teamwork and camaraderie increased as the season went on, as did the rivalries. The standard of hockey also improved greatly. A major part of the improvement was due to a lot of hard work by many people on and off the ice. I enjoyed all of the training and scrimmages that I did which has helped to improve my play and skating. Having a regular routine has been very difficult for me over the years however over the three months, my routine that I was able to choose – and change if need be – was an important factor in my development and improvement. Rarely can a hockey player simply just skate during a game or at a single session a week and improve. I know that I worked extremely hard on and off the ice during the three months of the season. I have always been a hard worker, someone who puts a lot of time and effort into what they are doing. Even if I am behind the eight ball, that does not stop me from trying things! I still need to improve on stopping and going backwards and that is a job for summer. I surprised myself about how vocal I was on and off the ice during games. Also surprising me was a leadership role that I took for with my team and the Beerginners league as a whole. As a new league filled with new players, I saw the change from people who did not know each other to now looking like life-long friends. Long into the future, Beerginners originals will always remember their first season. I am also helping newer players with advice and techniques that I have learned. Never underestimate the power of positive encouragement and reinforcement. I have enjoyed my mentoring role that I am doing which fits in well with this competition – helping newer players develop. While I can still be reserved in some situations, hockey has helped further develop my social skills and interactions with a vast range of people since entering the sport. Getting out of my comfort zone has been a difficult job at times but I am willing to try new things. Indeed, many things about my hockey journey were totally unplanned. When I discovered the sport, I had zero plans to play or be any more involved than a casual fan. Look at me now! Playing hockey this season has made me watch hockey in a new way. I can relate to many things that happen on the ice during other games even if the skill level is different. I also encourage any new hockey player to skate to a reasonable standard before playing. Also, watching hockey at any level and knowing the basic rules and game procedures is very important. The more you know about the rules, language and culture of hockey, the easier things will be for you. Apart from this blog, Beerginners players will also be able to remember their season through the many game day photos taken by Demi Barclay. A newer sports photographer herself, she took to the task of capturing the best sides of players while they were on the ice. There were some classic moments captured forever on camera which sparked a lot of discussion after the event. There are many players who have changed their social media profile and cover photos which also helps with promoting the league and the sport. Nothing says “I play hockey” to your friends and family better than a profile photo of you playing. Another memento of the rookie season was the medals and Beerginners Cup that I purchased before the grand final. I think it is important to mark these milestones, not only for me but also for others. It was a surprise for many players to receive a medal and to see a league trophy. During the AIHL Finals weekend I was pleasantly surprised to receive my own MVP trophy in a special presentation on Saturday night. It was a humbling experience. In many instances in my life, I am not used to being rewarded in an appreciative way for my work. This trophy will sit with pride on my hockey related bookshelf in my studio alongside my Jets and league medals. I have made sure that my Jets do not miss out on a medal. I have had special Jets medals made which both commemorate the season’s result as well as the spirit of Jets hockey. The logo looks fantastic in the centre of the medal! Some players have a more permanent reminder of their rookie season. There’s at least one Mighty Drunks tattoo that we know of. Injuries have been relatively small in number considering the nature of hockey and the number of rookies. My jarred elbow and bruised knee – thankfully after the grand final – pale into insignificance compared to a dislocated tailbone picked up during training. Even in full hockey gear, injuries are possible. There certainly is a lot of gear to for a rookie to get used to! My training session after the grand final was tiring. I heavily bruised my left knee after falling on it. I may or may not have been trying to slide along the ice on my knees at the time. There were several times where I lost an edge and fell including landing on my stomach and winding myself in the general session beforehand. Luckily, a stray skate blade to the ankle during the same session failed to get past my shin guard. Ironically, the stray skate blade came from a team mate during a physical drill. With my rookie season over, it is time to keep moving forward to season two. Season two will feature two new teams and a lot of new players and is scheduled for Tuesday September, 19. However, due to being back at my place of employment, my appearances in season two will be limited. I am looking forward to welcoming new pilots to the Jets squadron while others are flying into the sunset to join other teams. During summer, the Grassroots crew and I will be busy. For me, the Australian women’s and junior ice hockey leagues means that top level hockey continues, albeit with a more relaxed schedule. I will also be working on continuing my hockey journey on and off the ice. Follow along right here via Take The Number 69: The Summer Season. Finally, there are several people that I like to acknowledge for the parts they played in my rookie season. My coaches – all of them – have been really patient with me and my fellow Beerginners. I have been able to learn and apply a lot of what I have been taught with good results. Obviously, I have plenty to learn. My Jets have been fantastic team mates. Some squadron members have been hockey friends for a while, others are Monday night development regulars, others were total strangers. We have gelled as a unit with a lot of positive talk and action on and off the ice. In particular, the leadership of Ash and Dean throughout the season has been greatly welcomed but also needed. The other teams (Trash Pandas, Wayward Sons and Mighty Drunks) have played their part in a great rookie season on and off the ice. There were many highlights in a fiercely competitive season. Many friendships have been formed across the league. The staff at Ice Zoo, Wayward Brewery, Erksineville Hotel and Max Arena have been gracious hosts. I have been spent many hours enjoying the various uses of these facilities. Grassroots Sports have hosted this blog and have been very supportive of my journey. Editor Ellie makes sure that my words don’t land me in the penalty box while producer Mick massages the words and the photos together to live on the website. My initial reason for playing Beerginners in particular and hockey in general was to play hockey with my friends. Mission accomplished! In addition to the friends I set out to play with, I found many more! Thanks Ev, Em, Ryzer and Jake for all of your support. Thanks to everyone in the Sydney hockey community that have supported Beerginners with advice and encouragement. Special shout out to Ice Dogs captain Scott Stephenson who came down to share his experiences with a league full of rookies. While his coaching record is 0-3, he is the only AIHL player with an assist in Beerginners history (a record most likely never to be broken). Beerginners would probably not have happened without the drive and dedication of Logan. Seeing a gap between rookie hockey players and the higher standard of Friday Night Hockey, there is now a competition in Sydney that is aimed at the true beginner. Ultimately, the aim is to see people start with Beerginners on Tuesdays and then move across to Friday Night Hockey. On a personal level, Logan and I have spent many hours online and in person working on my hockey and working on Beerginners. Knowing that running a rookie beer league would not be easy, I have assisted with the running and logistics of the league. This further develops my off ice skills and develops the league. Finally, thank you for reading. Yes, you! I hope you have enjoyed the season as much as I have had writing about and playing in it. The feedback and encouragement has been most welcomed! I look forward to summer and season two of Beerginners! Eric Brook has had many interesting experiences since seeing his first game of ice hockey in America in early 2014. After discovering Australian hockey, he became an AIHL and team writer. Eric has been a part of the social media team for the Sydney Bears, following the team across the country and providing updates on their AIHL season. He has also commentated games for both the Bears and Sydney Sirens (AWIHL). He created Harbour City Hockey as a one stop hockey resource for players and fans. This year, 2017, is his rookie year as a hockey player.